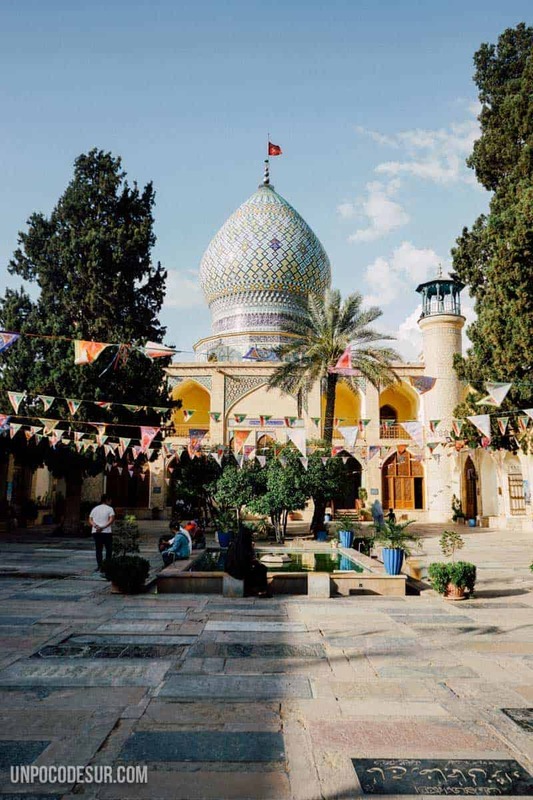 1 What to see in Shiraz? 2 Where to sleep in Shiraz? We arrived at Shiraz direct from Persepolis (here you can see how to get to Persepolis with public transport for less than 1 €) almost knowing that it would not be what all Iranian wanted to sell us, we knew it because no one told us about Yazd before, our favorite place so far and it seemed that Shiraz was theirs but for other reasons. We still had to give it a chance, it couldn’t be that all locals had it in their mouth if it wasn’t worth it. Shiraz was the heart of Persian civilization and one of the most famous and visited tourist destinations in the country. Mainly because of Persepolis, located just a few kilometres from the city, one of the “must see” of any trip to Iran. It is also supposedly one of the most open cities in the country, precisely because of tourism, but thankfully we did not miss that since already in places like Tehran or even in Sanandaj we had already tried a good part of that society that lived hidden under an authoritarian regime, we didn’t expect the same from Shiraz, actually we weren’t looking for it. Being honest from the beginning I have to say that as much as people told us great things about Shiraz, for us was not much more than mosques and gardens, and we were never great worshipers of gardens and… after a couple of occasions visiting mosques we actually stopped doing it, at least the mosques in Iran. So our stay in the city, after having seen what really interested us, was limited to working and planning our next destination. It is important to bear in mind that in Shiraz if would not be because of the absurd repression that the country has to endure, there would be a few more things that would have called our attention: Its poetic tradition, present in the history of one of the most recognized poets of Iran, Hafez, and in its wine. I’m sure that arrived at this point, if you are someone who enjoys minimally wine, you will know that there is a variety of grape with the same name, Shiraz. Before the Islamic revolution, Iran had a huge tradition of wine that is still present in the hidden basements of many people (as in the family that offered us homemade wine during our stay in Sanandaj). The first evidence of grape cultivation for wine production in Shiraz dates from 2500 BC. On the 14th-century Hafez, the poet, immortalize the importance of wine in his poetry. In 1680 a French merchant describes in Europe the taste of Iranian wine, “of a very specific red”. when the ban on alcohol came in 1979, vineyards were closed throughout the country and they try to vanish one of the most important of the city history. With all this said, if you are the Mosques and gardens type here are some ideas for the city. And if you’re not, sit down and talk to the locals, I’m sure you’ll learn something new, maybe they even invite you to a glass of homemade wine. 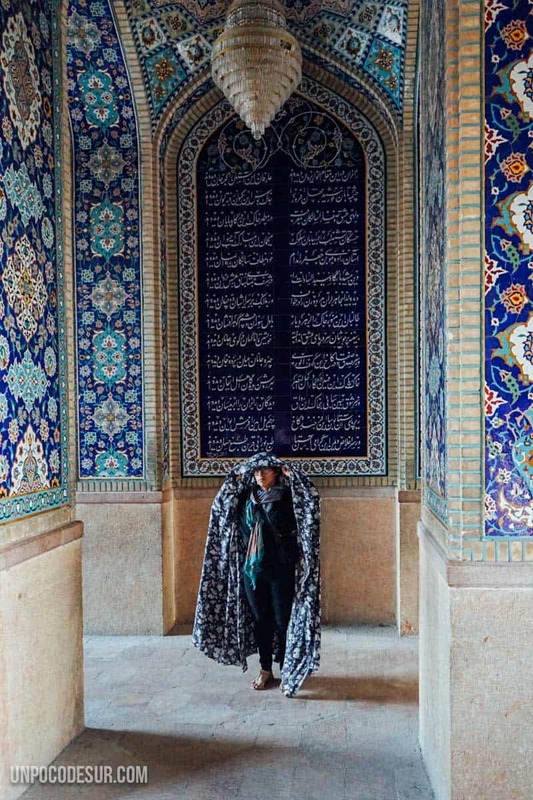 What to see in Shiraz? Our first mosque in the city and one of the first of the country, we had entered others before but only to those who are free since, as we mentioned before, we are not big fans of paying to see religious and cult locations. In this case, we ran into the dome by chance walking from our accommodation to the centre and decided to take a look, a small and colourful patio welcomed us and for the first time, I had to put a chador to cover myself. The atmosphere was nice, the sun was shining and while Jesper stopped to chat with the Imam I asked permission to take some pictures. A group of women was praying and looked at me with a smile. We didn’t see a single tourist and considering that our experience with Iranian mosques is short but intense, it was our favourite. 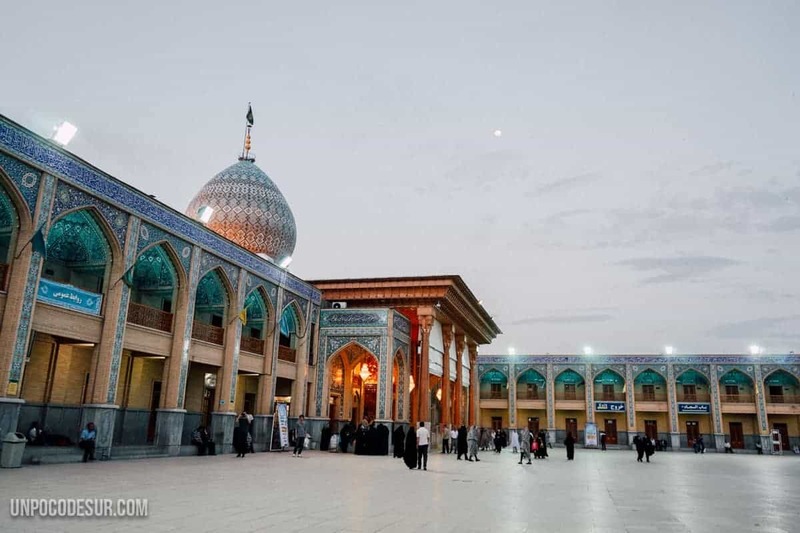 As we told you before Hafez is one of the main figures of the city and the country, there will be no Iranian house in which they do not mention it at least once. His body is buried here, a place of pilgrimage for many locals. 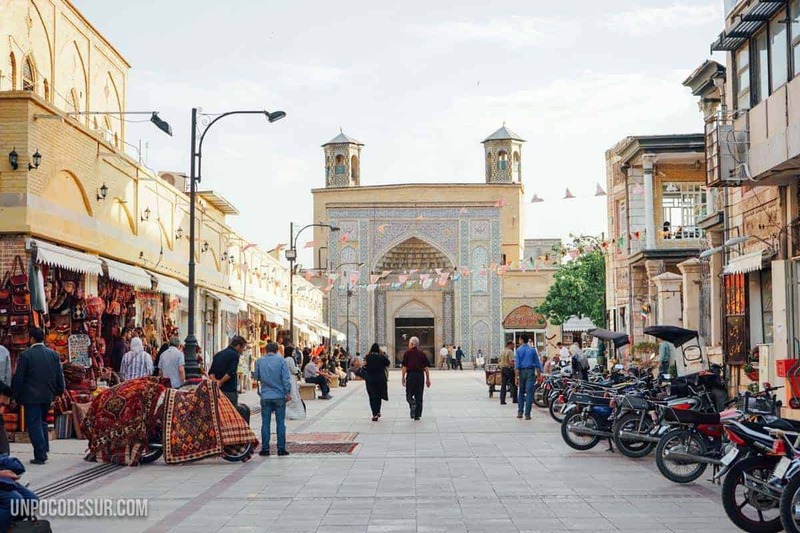 We decided not to go, in Iran, we had to shorten many expenses due to the theft we had in Tehran so we can’t give you our personal opinion, but we know it’s in all the tourist guides and everyone you ask where to go will end it mentioning eventually. la entrance costs 150.000 per person and is open from 8 am to 9:30 pm. The most important mosque in the city and one of the largest (and beautiful) complexes in the country. We entered again since it is free and to satisfy our curiosity after our first time, but contrary to the friendly and open atmosphere that we found in our previous experience, here the thing was quite the opposite. Just arriving we had a couple of security checks, they gave me a huge chador and we got together with another group of tourists to follow a guide the “guide is free” but is more like a security guard to no let you roam freely than a guide itself, so don’t expect to get a lot of information from there. The square is spectacular and it’s very nice to see people making use of it, for a moment I thought it was a beautiful place but I changed my mind at night when talking to one of our newly acquired Iranian friends told us that before that space was a gigantic square open to everyone… now it’s a mosque, another one (his words). On top of that the chador, in this case, made me feel miserable, it was long and it was between my legs all the time, the rest of the women of our group seemed to feel the same way, I was unable to take pictures because I had to have my hands busy to hold the thing, I couldn’t even scratch my nose without making a drama. Eventually, I had to stop and squat to prevent the chador from blowing in the air. There was a moment when one of the women in the group dropped a card on the ground and was totally unable to pick her up herself because she couldn’t move freely. It was horrible to see how your partner and the rest of the men moved with total freedom and you looked like a mummy, I felt cancelled, I felt miserable… and after that experience, I decided I wouldn’t go into one more mosque again at least in Iran, even for free. As you can imagine for what I told you at the beginning of this writing we did not visit these gardens, first because of budget, but also our lack of interest, but we leave you the information in case you are interested. Entry per person costs 150.000 rials and is open from 8 am to 6:30 pm. Casually this was one of the reasons why I came to the city, I had seen thousands of photos of the windows letting in an intense pink light… I had to see it with my own eyes. Well, it’s not to exaggerate, but after our last mosque visit I had a lot of contradictory feelings so I ended up deciding no go, I don’t regret it at all but as it is still one of the main points on the “what to do in Shiraz lists” so if you are interested it is important that you know that in order to be able to catch the light in such a way it will be necessary for you to go first thing in the morning. The entrance costs 160.000 per person and the best is to enter before 9 am. Built in 1766 by Karim Khan, founder of The Zand Dynasty, briefly remembers a medieval fort by its exterior form and its walls, impossible to go unnoticed walking around the city as it covers a total area of 4000 m2 inside and counts with 4 huge towers 14 meters wide each. For what we know inside there is a museum, the price is 150.000 rials per person and the opening hours are from 8 am to 7:30 pm., more than the inside we loved it on the outside, A square that is the centre of the social life of the city. Last but not least, the strong point of the visit to Shiraz of almost all travellers passing through the city, the visit to Persepolis. 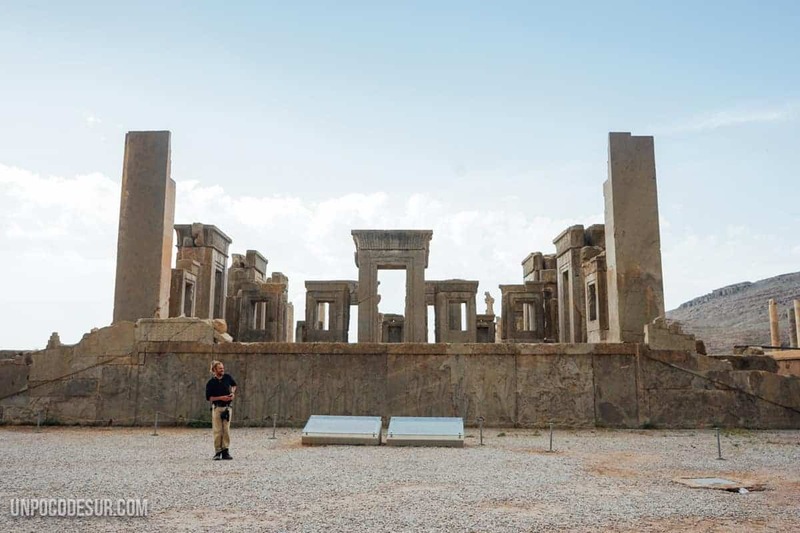 As ours was a stay of an entire morning and also we did it on our own, we have a lot to say, so if you are interested to take a look at the specific post: How to get to Persepolis with public transport we explain everything there. Where to sleep in Shiraz? Being pretty touristic all prices rise, everything we found online was out of our budget so we decided to arrive early and just walk the street Takhti Street as recommended by some locals. There we found the Shekofe hotel (among many others) where we paid 400.000 rials per night in a Double Room (with fridge included), one of the cheapest and the best accommodations in the country.